Laura Resnick is the author of the forthcoming Planeswalker novel, The Purifying Fire (July 2009), which is based on the popular fantasy card game Magic: The Gathering. Laura will be my guest next tomorrow to talk about the book and the challenges of writing an original fantasy novel based on an existing franchise. Check out my contest here. 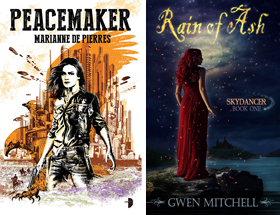 Laura is at SciFiChick TODAY to talk about what she enjoyed most about writing for the Planeswalker series, her writing career, what inspires her, how she spends her leisure time, and her next projects on the radar. SciFiChick is also running a contest for 5 giveaways of The Purifying Fire. July 9th - Laura will be at Fantasy Café to talk about her research process, her experiences living abroad, and what book she’d love to take credit for if history could be rewritten. I am quite impressed that Laura Resnick will be your guest. I am also well aware of her father Mike Resnick who has to be one of the most prolific writers of all time. I would absolutely love to have both of them donate books for the Vilnius Jewish Library. Since the library is designed to feature all things Jewish, what better than to have two incredible writers who happen to be related having their books showcased in the Jerusalem of Lithuania.